It is less than two months before the historic visit of Pope Francis to Philadelphia, and interested people healthy enough to walk city streets for the events face a dilemma of how to get into the city. Seats on parish bus groups have long since been filled and official information on traveling by car has been nonexistent. That leaves riding into the city by train the only option for thousands of people. But that option fell into doubt as SEPTA announced a plan July 28 that throws the matter to random chance. 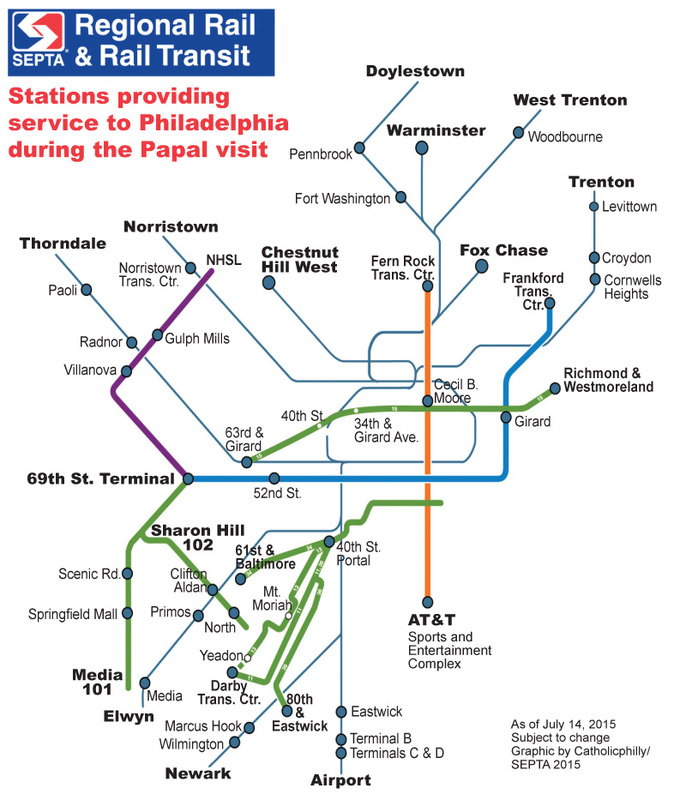 The regional transit agency attempted to sell one-day passes for each day of the papal visit, Sept. 26 and 27, through its website beginning Monday, July 20. But naturally the demand was high and SEPTA’s online system crashed within minutes. A week went by with no fix for the system. So a Plan B posted late Tuesday on the agency’s website describes a lottery system for the chance to purchase up to 10 of the $10 tickets, plus a $1.95 shipping fee. Seniors and people with disabilities may purchase $5 passes. People wishing to travel the Regional Rail system on either or both of the days of the papal visit must visit www.septa.org on Monday, Aug. 3 only, click the “Enter Lottery” link, fill out the application form, and wait to be notified by email on Thursday, Aug. 6 whether they have been randomly selected by SEPTA to purchase the tickets. Patrons will receive an email link leading to the ticket purchase section of the website. SEPTA called the lottery system a “first round,” implying that subsequent opportunities to purchase the passes might become available. Ticketleap will then select “winners” at random from the valid entries, according to the statement. The unprecedented system is the agency’s way of transporting a maximum of 175,000 riders on the Regional Rail trains into and out of the city on each of the two days of the pope’s visit. Managing that number of people is the reason the agency has given for its plan to accept only the special one-day passes — and no others including patrons’ existing monthly or weekly Transpasses, tickets or on-board fares — and limiting the number of stations in use to two per train line. Hopeful train patrons participating in the lottery will need to preselect the outlying station they will use, plus the times they expect to depart and return. Departure times from the outlying stations are mostly in two windows, 5:30 to 8:30 a.m. and 8:30 a.m. to 12 noon. The exceptions are the Cornwells Heights Station, available from 5:30 to 8:30 a.m. only, and the Croydon Station, available from 8:30 a.m. to noon only. No trains will return to the outlying stations until nighttime, beginning at 5:30 p.m. until 12:30 a.m.
That means on Saturday, Sept. 26, people wishing to see Pope Francis arrive in Philadelphia for the 10:30 morning Mass at the Cathedral Basilica SS. Peter and Paul will need to stay in center city all day if they wish to experience the pope’s 4:45 afternoon address at Independence Hall and the Festival of Families at 7:30 in the evening. The papal Mass Sunday, Sept. 27 on the Benjamin Franklin Parkway is scheduled to start at 4 p.m.
As announced previously, only 18 stations throughout the Regional Rail system will be open for use during Sept. 26-27. Parking at even the largest of the stations is very limited, and SEPTA advises travelers to get a ride to the station from a friend. The trains will stop only at one center city station and not the three stations riders may choose during a typical train trip. Whether travelers disembark at Jefferson Station, University City Station or 30th Street Station, they will have to walk the remaining distance to the papal events. With the implementation of the train pass lottery, those people will have to consider themselves lucky to make it that far. SEPTA has really dropped the ball with this. I fail to see why they couldn’t rent or subcontract for more trains from Amtrak, NJ Transit, MARC (Baltimore/Washington), VRE (Virginia/Washington), Metro North (Upstate New York & CT) MBTA (Boston), and maybe even Chicago’s train system. Since trains are only going into 30th and Market East, they could have even rented diesel trains going into 30th Street. I’m sorry, but this is a major fail from SEPTA. I am disappointed and truly do not understand why SEPTA cannot transport more people since the trains are only running a few hours a day. So many people have been trying to make this special event available for everyone but this lack of transportation will limit the number. It will certainly be a bad mark for Phila….and the whole world will be watching.